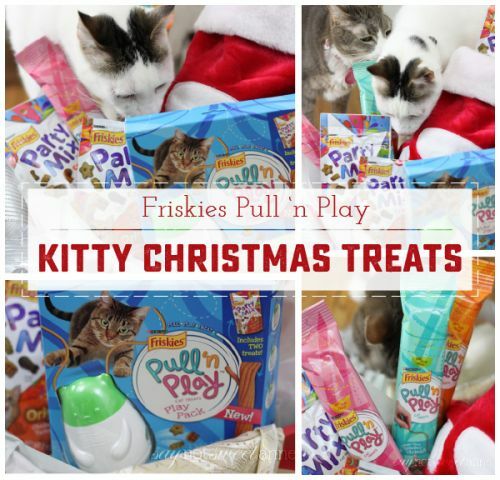 This is a sponsored post written by me on behalf of Friskies Pull ’n Play. All opinions are 100% mine. One of the sad truths about having a new baby in the house is that I spend less time with my kitties. At first they didn’t seem to mind but soon one cat, Sophie (the pretty grey one with the pink collar in this post), started losing weight and refusing to eat. I can’t blame them for being emotionally distressed, I’m their mama too! That noisy naked thing keeps hogging all of my attention and now that he can crawl, he’s starting to attack them! So, I’ve started devoting at least 20 minutes each day to Kitty Kayla play time. We go in a room by ourselves with their favorite toys and we all play. Its a nice respite for me AND for them. 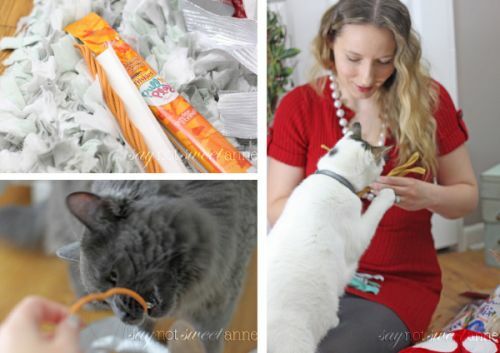 Now that Christmas is coming up (and the cats are destroying my Christmas Tree) I’ve been thinking about how I can do something special for them during our Kitty Kayla play time. 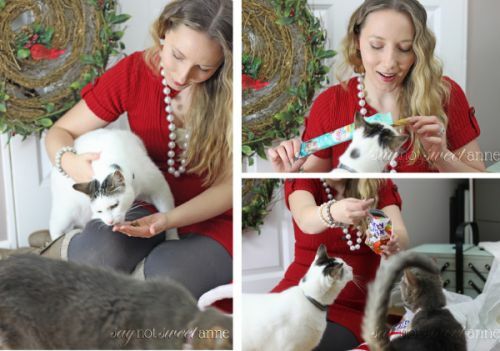 When I was contacted about giving my cats a stocking full of amazing new Friskies Pull ‘n Play treats, I was thrilled! These treats are both toys AND treats! They are edible, but still fun. 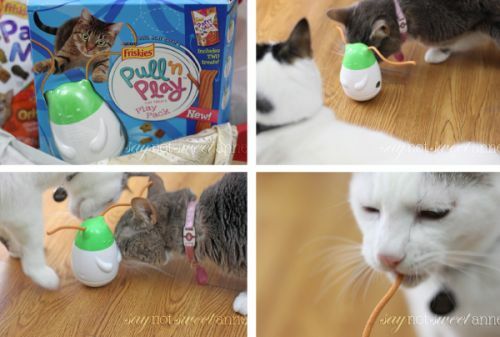 The Pull ‘n Play is an edible string that you can use like any other string (or shoelace, or necklace chain?) that your cats play with. They come in Chicken & Cheese, Salmon & Shrimp and Tuna and Crab flavors. Win Your Own Gift Box! ← 30+ Beautiful Handmade Gifts and $250 Etsy Giveaway! Mimi loves her toys. She tumbled head over heels attacking a fuzzy mouse this morning. She’s always running around like a crazy thing. My cat has been naughty! He climbed into the kitchen sink to eat food scraps and tried climbing into the oven when it was on when I opened it to check on my cooking chicken! Your cats are so cute! I have two cats, Ricky & Odo (boy and girl). My little Ricky is fiercely loyal, but the biggest fraidy cat. Over the summer I moved into a loft apartment, which doesn’t have a lot of hiding places for him. But every time he would get scared he would hide someplace I couldn’t find him. At first I worried, but he always came down to me after a little while, so I trusted him. Finally, one night when some electricians were at my place late my little Ricky went away and hid. I went to my lofted bedroom to look for him and finally found where he hides! He climbs under the bedroom covers and hunkers down for deal life. He will stay there until he has a long while of silence then slowly comes back to me. He’s a little cutie. Thanks for the chance to win! My Ricky & Odo would love this treat in their Christmas stocking! My cat, Chester does the cutest/funniest thing! He has this plush bone toy that he loves to carry around at night in his mouth. It’s so cute because he meows with it in his mouth, so the meow sounds very muffled. He always brings it to me and lays it by my bed. He’s so sweet! My cats name is Cheddar (yes, he’s orange). One of the cute funny things he does is jumps into bags, boxes, purses and suitcases. He is so enthusiastic about it that it makes taking him to vet a breeze, I just open up his cat carrier on the top and he jumps right in like its a game! My cats name is cezara and she when you tell her no or to stop doing something she looks you in the eye and sticks out her tongue she is siamese so she also says no .we had a repair man in and put her in her room and blocked it off while he was there .she started growling my daughter said stop it cezara she replied no,the repair man said did that cat just tell you no. Ha! It is SO FUNNY when my cat “talks back”, But his (Its always the white one, Antigone) never sounds like real words!